This cemetery can be reached by taken the North Strand Road from the city centre, through Fairview, and turning left on the main Malahide Road, keep straight out towards Malahide, where you will pass Campion Public House, Balgriffin, take the first left turn beyond this. You can also take the No. 42 bus and get off at the bus stop beyond Campion's and walk up the short road, which is a cul-de-sac that leads to the cemetery on your right hand side. 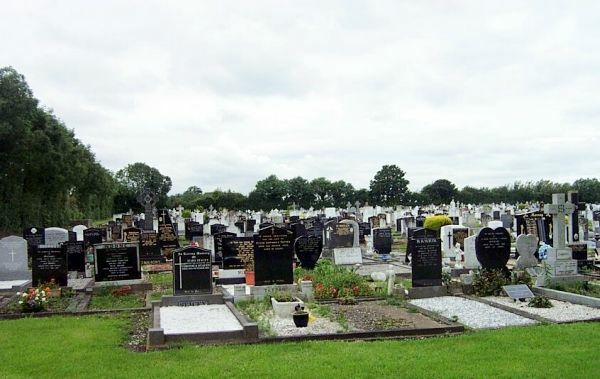 Balgriffin Cemetery was opened on the 20 Oct 1954 and is very well maintained by Fingal County Council, previously Dublin County Council, who operate and maintains many cemeteries within its area. While it is classified as full, there are still burials taking place, but only for those who have previously purchased family plots within it. This is not a complete listing of burials in this cemetery! The records below were provided by contributors to Interment.net. Last edited Apr 9, 2016. Total records = 1,667.